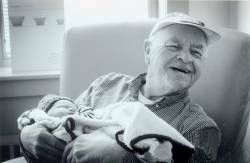 Richard A. Giroux a longtime area resident passed away early Wednesday, June 7th, 2017, at the Northwestern Medical Center surrounded by his loving family. Born in Clarksburg, Massachusetts, on May 10th, 1936, he was the son of the late Raoul and Georgianna (Richard) Giroux. Richard was 81 years old. On April 27th, 1954, at Our Lady of the Lake Church, he married Ramona Austin, who survives him. Richard was educated in Massachusetts and spent most of his life in the wire and cable industry. He retired as Plant Manager from the Champlain Cable Company. While working for various companies such as ITT Supernant and Times Wire and Cable he had many positive experiences. In Swanton, Richard was known as the “Bike Man” with all his work on bicycles and his generosity to the area youth who were in need of a bicycle. He also enjoyed working on tractors and was known for his lawn sales. Richard was a gentle, kind, and loving man. His family was most important to him. Survivors include his wife of 63 years, Ramona, of Swanton; their children, Ralph Giroux, of Highgate, Russell Giroux and his wife, Jane, of Alburgh, Ramona and Scott Brown of Orange, Massachusetts and Renee Aube and her partner, Bradley Beyor, of Swanton; his grandchildren, Robert and Carol, Christa and John, Karen, Richard Jr. and Samantha, Anni and Dale, Katie and Paul, Ralph Jr. and Katie, Jacques and Paulina, Jacqueline and Jason, Nicole, Christian and Ashley, Shannon and Dereck, Sammy and Brent and Mindy and Chris, as well as his great- grandchildren, Alex, Jessica, Ashley, Michael, Alyssa, Jaxen, Charlie, Ryker, Ivan, Ty’Rell, Ja’Rell, Ma’Kell, Alexander, Dante, Tristian, William, Marcie, Mallorie, Brantley and 2 great great-grandchildren, Sean and Matthew. Richard is also survived by his brother, Bernard Giroux and his wife, Gloria of Swanton, several nieces, nephews and special friends, Joanne and Burr Russell of Enosburg and Anita and Butch Furrow, of Connecticut. In addition to his parents, Richard was pre-deceased by his son, Richard F. “Dickie” Giroux on January 29th, 2002 and daughter-in-law, Kathy Giroux on August 2nd, 2013; his sisters and their spouses, Teresa and June Poissneault, Jean and Lionel Miller, Helen Giroux and Ann and Fred Canfield. His family would like to thank the staff and doctors at Northwestern Medical Center for the care and support given to Richard and the family during his stay. Richard’s family will greet family and friends on Saturday, June 10th, 2017, from 11:00 A.M. to 1:00 P.M. at the Heald Funeral Home, 87 South Main Street, St. Albans. A funeral service will follow at 1:00 PM with the Reverend Joseph Ikegbunam officiating. Interment will be in the family lot in Sheldon Village Cemetery. Following the interment, refreshments will be served at the Giroux residence in Swanton. For those wishing to honor Richard’s memory, contributions may be made to the Alzheimer’s Association, Vermont Chapter, 300 Cornerstone Drive – Suite 128, Williston, Vermont 05495. To send Richard’s family a written expression of sympathy or share a memory, please go to his on-line guest book at www.healdfuneralhome.com.